Critical Commentary (Notenteil). Composed by Arnold Schoenberg (1874-1951). Edited by Christian Martin Schmidt. Sheet music. Arnold Schonberg - Samtliche Werke. Classical. Critical commentary. 195 pages. Schoenberg #AS1001-22. Published by Schoenberg (HL.49042506). 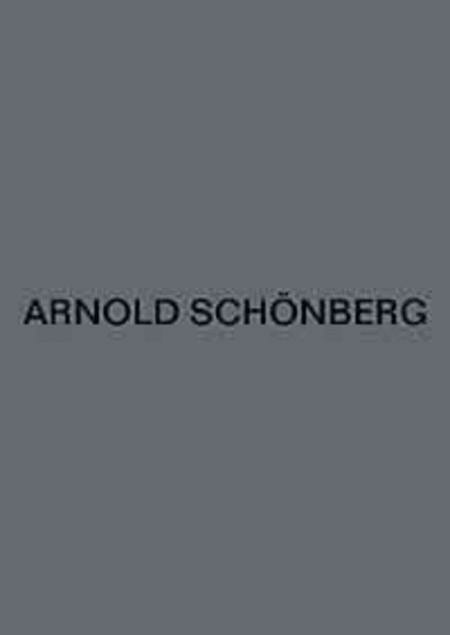 Arnold Schonberg is the central figure in the musical world of this century. His musical significance was already apparent during his life-time, but his posthumous influence has increased immensely. His work paved the way for ground-breaking changes in musical perception. This complete edition aspires to be equally indispensable for research as well as for performance. The edition is published in two series: series A in folio format contains all completed works, all piano scores prepared by the composer himself and all unfinished works suitable for performance; also fragments (large scores) which are better suited to be printed in such a format. Series B, in quarto format, contains early versions, sketches, ideas and fragments as well as genesis and a Critical Commentary.